Need some extra help with meal planning? Get my step-by-step workbook to walk you through the process of making a meal plan that works for you! 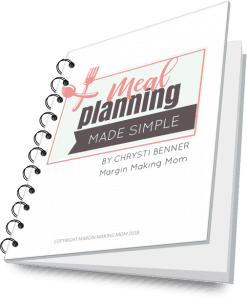 Get Meal Planning Made Simple Now! Have you tried meal planning in the past, but felt like a failure when you couldn't stick with it? When 5:00 rolls around every day, are you left wondering, "What are we going to have for dinner?" Do you feel like cooking meals at home is out of reach because you can't spend all day in the kitchen? Are you tired of going through the drive-through multiple times a week, busting your budget and straining your health? Do you find yourself buying food at the grocery store with good intentions, but then throwing it away later because it went bad before you used it? I can relate. I've been there, too. That's why I created Meal Planning Made Simple. I remember the days of stopping by the grocery store after work MULTIPLE times a week, aimlessly wandering the aisles in hopes of some dinner time inspiration. I remember stretching our limited budget and going out to eat YET AGAIN, because I forgot to thaw out the meat I needed for dinner. I was wasting precious time and money on a regular basis, simply because I didn't have a solid plan. That all changed when I started meal planning. As a mama with three little kids at home, going to the grocery store several times a week wasn't going to cut it anymore. As our family grew and we were also trying to pay off debt, we really needed to stick to our budget. Over the years, I've created a meal planning system that works. I've learned to devise a weekly plan super fast (because mama ain't got time for any long, drawn-out processes). These days, I know what we're having for dinner before the day even begins. I'm able to feed my family well without breaking the bank. And I don't have to spend all day in the kitchen to do it. I hear from women all the time who feel overwhelmed by dinner time. They're stretched thin and need quick and easy solutions for planning meals and getting dinner on the table. That's why I've taken my tried and tested process and included it all for you in Meal Planning Made Simple. It's designed to be an easy-to-implement plan that gets you results. Click Here to Get Meal Planning Made Simple Now! Step by step instructions that walk you through the process of creating a meal plan that works for you! Printable forms to keep you organized and simplify the meal planning process even more! Includes a sample meal plan full of an entire month's worth of easy meals that you can use for inspiration! Ready to transform your dinner plans?